Recruitment are 14 posts. Category wise vacancies are given in the notification. Desirous/ talented candidates who have satisfying all eligible criteria must need to apply for the current recruitment using the official website www.akolazp.gov.in. Read the instructions from official notice and fill the application. Starting date to submit application is 30-10-2017 and closing date is 10th November-2017. Mode of application is online. Candidate must have qualified Degree in Social Sciences/ BSW (Bachelor of Social Work)/ MSW (Master of Social Work)/ MBA/ Post Graduation in Rural development from any recognized University. Upper age of the candidate should be below 33 years for Open Category and for reserved category is 38 years. Selection of applicants for Group Coordinator Jobs is based on their merit in written test and Interview. After selection candidates will get fixed monthly salary of Rs. 18,000/- plus allowances admissible as per rules. More updates regarding Zilla Parishad Akola Group Coordinator Jobs Recruitment details, Educational Qualifications, Age limits, Selection process are given below. Post Name: Group Coordinator: 14 posts. After selection candidates will get fixed monthly salary of Rs. 18,000/- plus allowances admissible as per rules. Candidate must possess Degree in Social Sciences/ BSW (Bachelor of Social Work)/ MSW (Master of Social Work)/ MBA/ Post Graduation in Rural development from any recognized University. Please for through ZP, Akola Official notification for full details. Maximum age of the candidate should be 33 years for Open Category and for reserved category is 38 years. Mode of selection for ZP Akola Recruitment vacancies is based on candidate performance in written exam and Interview. Candidates need to pay Application fee of Rs. 100/- by Challan Mode. 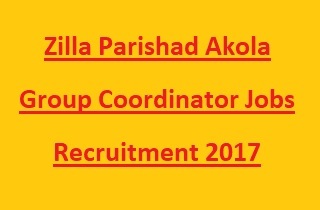 Willing/ Eligible applicants may apply for ZP Akola Group Coordinator Jobs using the link www.akolazp.gov.in. Download and read the instructions available in the notification. Upload the online application with required documents/ certificates. Online application submission starts from 30-10-2017 and closed on 10-11-2017 before 05.00 PM.